Have you noticed that folk today really don’t want to read articles – they want to look at pictures or watch videos? The old wag “a picture is worth a thousand words” is being borne out every day. Heck, I wanted to install a louder horn on my Vespa scooter – I read about how to do it, but until I went to YouTube and saw the video I really had no clue what the words were trying to tell me. The video showed me exactly where to put the horn. Is there a place for words – apparently, in as much as you are reading this Tid-Bit. And I thank you for doing so. Because this Tech Tid-Bit focuses on something that I think is very important for the growth of the NAWCC: Offering members how-to videos of making, repairing and restoring clocks and watches. I have started making videos to show the various subjects I write about. For example, Tid-Bit 18 included a couple of videos that showed, through a microscope, what it looks like as I gently heat a workpiece to flow solder into place. Tid-Bit 19 had three videos showing various aspects of stoning and burnishing pivots, both through a microscope and as an overview. My Tid-Bit 19 videos were recently included in an F-103 Field Suitcase Workshop. One of the instructors commented that he had never seen anything like it – being able to see how a pivot looks through a microscope as it was burnished. The students “achieved results that were far superior to anything they had done before”. My hat is off to Lex Rooker for his work in upgrading the Field Suitcase Workshops so they include videos! Why do we need videos? To attract younger folk and people around the world who can not attend NAWCC courses, and to improve out ability to educate our members. Or, more simply, to get the NAWCC on a growth path. Who will make these videos? Easy answer is to go to the bathroom and look in a mirror. Every one of us who has skills that are worth passing on needs to focus on making videos. If there is a great presentation at a chapter meeting – it should be video-recorded. If you are planning to enter a project in the craft competition – you should include a video of the steps that will help others follow in your footsteps. If you are taking apart or putting together an unusual mechanism – make a video. Or, perhaps you can offer to assist others with your skill in editing videos. I believe we all need to do what we can in creating videos if we want to attract more members and see our organization grow. Putting my camera where my mouth is, this Tid-Bit is focused on the things I have learned about photographing and video-recording the things I do. Safety: One would perhaps wonder what could hurt one while shooting video. While it would seem that having a video camera recording what you are doing should not risk injury to your self, or damage to what you are working on, I have found that trying to record what I am doing can be rather distracting. I will look up for a second to see if the camera is pointed at what I am doing – if the image on the view-screen is what I hope it is. When I look back down at the work piece I get the chance to figure out where that little washer went. Or, if I am soldering, well, let’s just say it is not always pretty if one looks away. If you haven’t video recorded yourself before, plan on a few dry runs – go through the motions in front of the camera – then play back what you recorded. Do it a few times – get used to the controls, how to get the focus right – get to the point that you are not looking at the monitor to make sure it is recording what you want shot. It is also important that each camera is mounted securely so you won’t inadvertently knock it over, or worse, have it fall on your workpiece. I love cameras mounted on articulated arms so they are up, out of the way, and not resting on a tripod on or beside my. Tripods always seem to be in the way. There is another aspect to safety – including any precautions in your video to help safeguard others who will potentially try to do what you have done. Give some thought to what could go wrong as someone else does what you are doing, and include comments at the beginning to make your viewers aware of potential pitfalls. Tools: The subject matter that you intend to cover in a video will likely involve specific tools. It is a good idea at the beginning of a video to provide an overview of the tools you will be using and any special characteristics that you feel are important – using bent-nose pliers and tweezers instead of needle nose pliers for example. Cameras: It amazed me when I started thinking about video – I realized that cameras I was using for shooting still pictures also shot video. Sure, I had figured this out a few times, when I or my wife accidently managed to video record, unknowingly, when we thought we were shooting stills. And, hey, some of those videos were surprisingly good. I am especially fond of the cameras that are the size of a pack of playing cards – like the Sony TX20 or the Nikon Coolpix AW100. These cameras don’t have a lens that protrudes from the front so you don’t have to worry about how far the lens sticks out when setting it up on a microscope. And they shoot amazing video. The video’s mentioned above were all shot with an older Sony camera. The compact cameras with protruding lenses also work very well, you just have to take a bit more care is setting them up on a microscope. Get out the instruction manual for your camera – see what it can do. Shoot a few trials. I think you will be amazed. While I have used full-sized digital cameras – the DSLR (Digital Single Lens Reflex) cameras with bellows and close-up lenses, in truth, they are just too big and bothersome. The quality offered by the really compact little cameras is phenomenal and they are so much easier to set up. I usually will be shooting with the camera set for close-ups – not macro (as in microscopic) but just close ups. Think about it, the camera will be 10 to 20 inches from what you are working on, or, if mounted to a microscope, it will be 15 or 20 inches from the workpiece - in the “close-up” focusing range. Which reminds me of a gentleman who was seeking help in figuring out a problem with a mechanism. He kept sending me out-of-focus pictures, claiming that was the best his camera could do. When I found out he was using a fairly new Sony I pushed him to get out the manual and find out how to change the focus settings. Needless to say the next pictures were superb. It really is important that you spend a bit of time finding out what your cameras can do. I especially like it when a camera offers the option of touching the view screen to direct where the camera will focus. A very neat feature. It allows one to get extremely good definition on that particular part we want to focused on. The other thing I have learned is to use more than one camera. The video of my stoning and burnishing a pivot in Tid-Bit 19 used 2 small digital cameras. One shot an overview, the other shot through a microscope. Likely if I had thought of it a third would have also been handy shooting from another angle to show details not visible to the other overview camera. Or when my fingers were in the way of the camera. If you happen to have a video camera – these are especially good for the overview shots. Some offer remote controls so you can even zoom in on your workpiece to show additional details while the camera is recording. Microscopes: Given my age, and the fact that my eyes are just not what they used to be – I have found that microscopes are the perfect way to see what I am actually doing – rather than just looking and hoping it is going right. The biggest problem with the videos that I get from folk who want help troubleshooting a mechanism is you just can’t see what they are trying to show. Either they are not in focus (80 percent of the time) or they just don’t show the detail needed. As I discussed in Tid-Bit 14 “To See or Not To See” http://www.snclocks.com/TechnicalInformation/Tid-Bits/To-See-or-Not-To-See/20676662_4hDXhv#!i=1648975898&k=65nq3sJ . And, if you are trying to share your work – your audience really needs to be able to see what you are doing. There are a number of ways to provide a microscopic view of your work – some involve digital microscopes like the Dino-lites – but I prefer the image quality I get out of mounting a digital camera to one of my microscopes. My first effort at shooting videos focused on shooting through microscopes. Why go to the trouble of shooting through a microscope? I find that most of the intricate work I do anymore is done under a 10 power microscope. To effectively share my techniques I had to develop the ability to record what I see through microscopes. I had already found that I could shoot stills through a microscope by just holding the camera up to the eyepiece and moving the camera around until the camera’s monitor showed what I wanted to shoot. For videos it became more important that the camera be steady for the time it took to shoot the video. 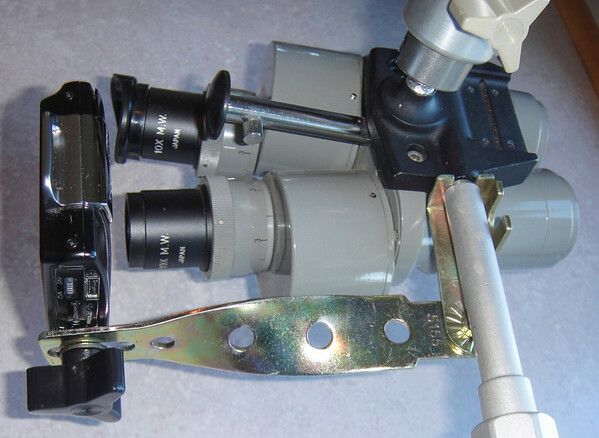 I went to the shop and found a couple of pieces of metal that allowed me to mount the camera in front of the eyepiece. My home made contraption is shown in Figures 1, 2 and 3. A rather nifty mount that I found on eBay is shown in Figure 4.